How to pack five people for five weeks into a small space? That is something that many people have asked me and it was the question I faced as the primary organizer of at least my kids and myself over the past three months. Anytime I had a chance, I was on Pinterest looking for tips and tricks, and keeping my eyes open as I ran my normal errands, looking for anything that might jump out at me as a means of efficiently accomplishing this task. 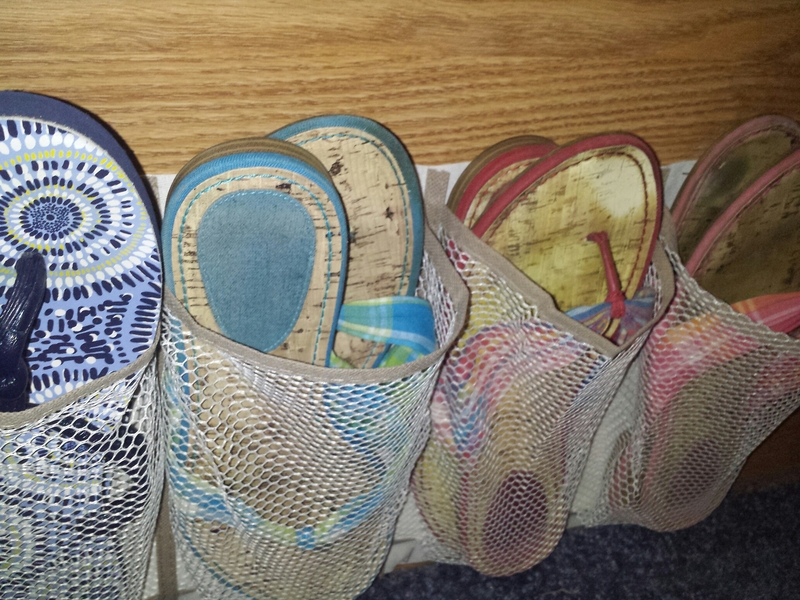 One shoe organizer was used by cutting it into separate rows and stapling it around my bed. 1) Shoe organizers: These were one of my best bets for our packing ease and they’re very affordable at less than $10 each. We had one closet that was a decent size and all three girls were going to be packed into that one closet for the five weeks; clothes and shoes. I hung the first one in the closet for them and all shoes, slippers and flip flops were going into it except running sneakers which are too bulky and would sit on top of the dog’s crate in the entryway. The second shoe holder I cut into strips, and utilizing a trick I saw on Pinterest and my new best friend, the staple gun, I stapled the strips of shoe holder all around my bed onto the fake wooden frame and I stapled one extra one to the wall near the entrance to the bedroom. This gave us lots of extra shoe storage space. I took a wide variety of flip flop shoes, sneakers and slippers and anything of the kids’ that didn’t fit into theirs could go into an extra space in ours. The shoe holder on the inside of the bathroom door is a lifesaver. The third one I hung in the bathroom, making sure it was the kind that had a netted pocket for each of the pockets, rather than plastic (I found these at Walmart) since some of thing things being stored in here would be wet, like toothbrushes. Into these 24 pockets went toothpaste, toothbrushes, hair brushes, hair accessories, makeup sponges, makeup remover, hair gel, face cloths (rolled), razors, dental floss and the like. You can hang anything with Command Hooks and strips. 2) Command Hooks, strips and a Staple Gun: I seriously could’ve bought stock in Command strips and hooks. I bought them in multiple styles and sizes. I hung all the artwork up with the strips and stapled the posters to the walls and ceiling above the bunks. 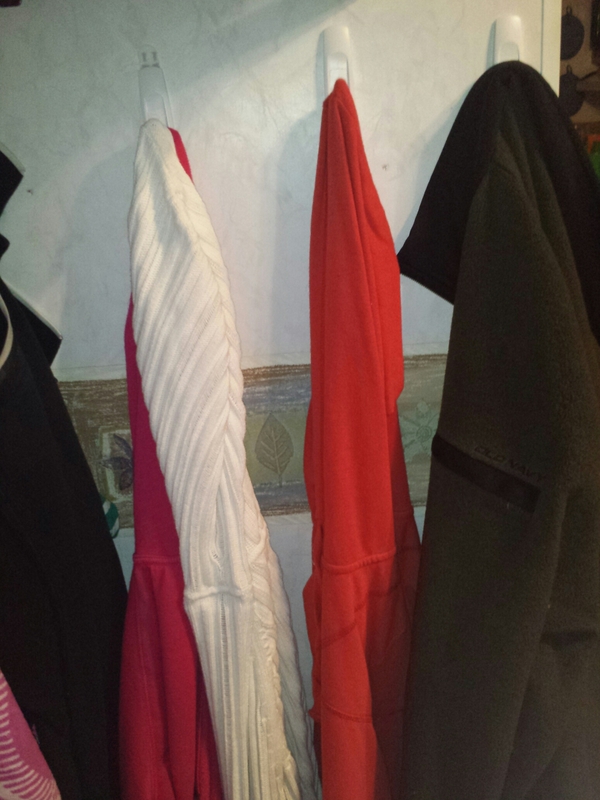 I used extra hooks to make hooks in our bedroom for hooded sweatshirts and used one to store a casual dress for each of us girls as a just in case outfit. I hung our clock in the kitchen with a command hook and I used them to hold all our sunglasses. You can Command hook or strip absolutely anything. These have worked out so well, as long as we keep them neat inside. It's been an easy way to pack everything needed for the five weeks. 3) Bins with drawers: These were one of my favorite purchases, and the best-of-all reason is that by using my Savings Catcher Reward dollars at Walmart, I got one whole set of three drawers for free. I had nearly $18 in rewards and the drawers were $17.88 each. I bought two sets so that each girl would have two drawers to themselves and everything would have to fit in those two drawers. My favorite thing of all was my idea to laminate two photos of each kid and use double-sided tape to stick them on. 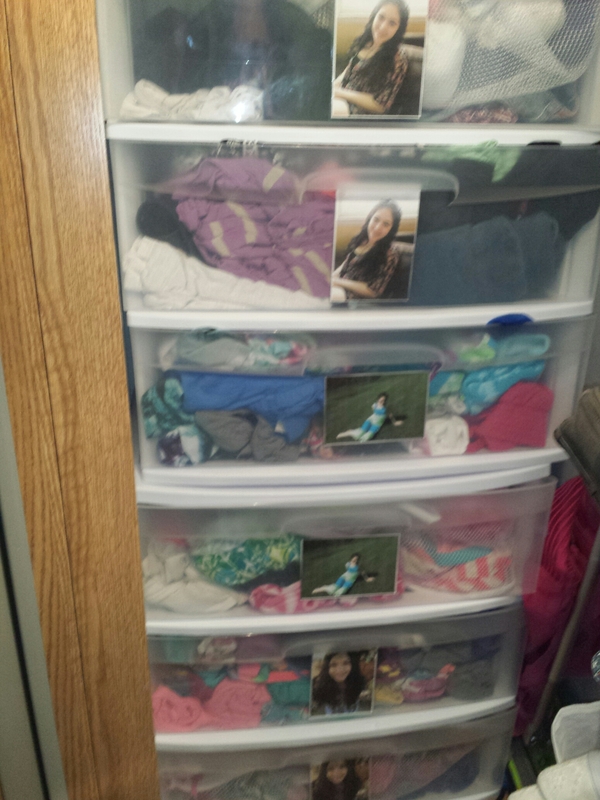 This way at one glance any of us could see whose drawers were whose, and the kids loved the personalization. 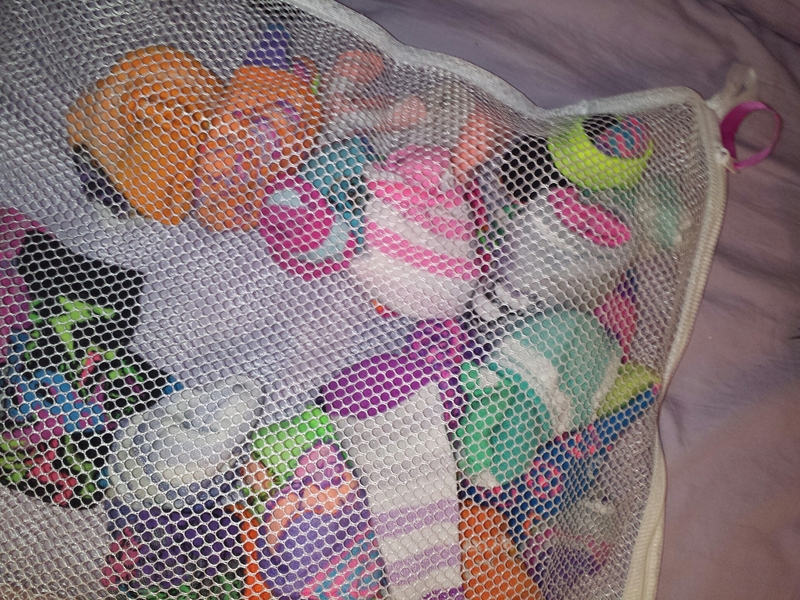 Each of the girls and I have a bag for socks, underwear and bathing suits. The girls have a ribbon in the favorite color tied to each of theirs so we know at a glance whose is whose. 4) Lingerie bags: As I pondered how to organize four sets of socks, underwear and bathing suits that were similar in look and size, I happened to think of the white mesh lingerie bags that one might use to hand wash delicates. I knew they were approximately $1 each, so one day I went to Walmart and bought 12 of them; four for each of us girls. I put ribbons through the loop of each, using my kids’ favorite colors, which are thankfully three different colors. At any given time any of us could see whose bag was whose. Into the bags the girls and I put socks in one, underwear in another and bathing suits into another. Those bags all went into one drawer along with pajamas and the other drawer contained rolled shorts, shirts and tank tops. With that, all three girls were packed. 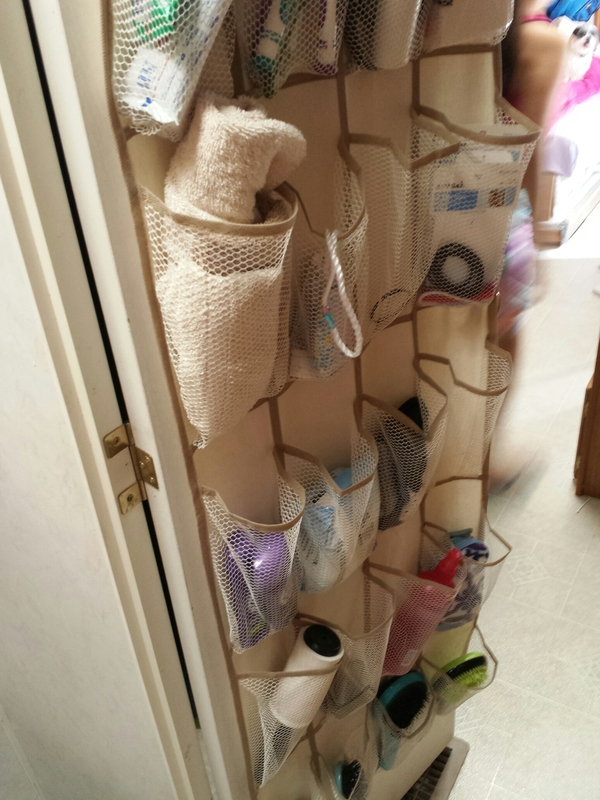 5) Plastic baskets: These were great for storing anything and everything. With a moving vehicle you need everything contained and secured as much as possible. Inexpensive plastic baskets can be put anywhere for travel: under the sink, into the cabinet, and even in the sinks and tub. 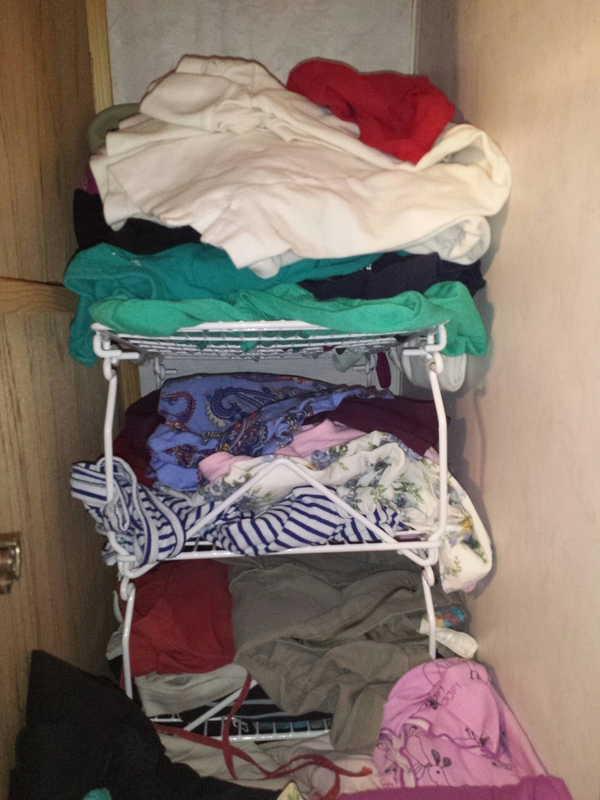 6) Laundry baskets: I mentioned in a previous post that we were able to use the underneath of our master bed for storage. We bought four laundry baskets and used a bin we already had. Into the baskets we stored extra sets of sheets, extra blankets, and one whole bin of cold weather clothes: sweatpants, leggings, and heavy sweatshirts in case we encountered any cold nights, which we did, on our very first night out. It was cold and rainy and everyone wanted something warm and cozy to sleep in. 7) Reusable grocery bags: These were great for pre-loading of the car and camper. I tried to organize like things together and put them into bags which I’d line up near the stairs for the truck or the camper. I had bags of snacks for the truck, library books, DVDs, electronics, my work bag, and a bag in which I organized all the trip related paperwork, booklets and my binder. I also used one for my daughter’s Which Way USA magazines which were took with us because we had one for just about every state we’d be visiting. On the day in which we actually loaded up all the drawers for the girls, we used the bags to carry out all the rolled up laundry so we could transfer it right into the drawers. I also used one to store my three mesh bags, which I kept on my nightstand. Meant for use in a kitchen, these stacking shelves have worked well for my small closet space. 8) Wire kitchen stackable shelving: One day when we were in Walmart, I happened to be in the kitchen section and noticed that they sold white wire stacking shelves, similar to my stacking cooling racks that I use when I bake. Our master bedroom had two cabinets that were long, deep and narrow that were our primary closet space and I was hoping to avoid a giant jumbled mess of clothes that would include pretty much everything I needed to bring with me. The closets also narrowed at the top, so they weren’t the same size inside from top to bottom. The kitchen stackable shelves were exactly what I needed. I could store clothes under them, on them and in front of them. I’d have to move things around to get to what I wanted at times, but it was my best option that I could find. 9) Drawstring backpacks: I must’ve packed at least five or six extra of these, not counting the ones that I kept my kids’ travel binders in (those are in another post altogether). I wasn’t sure what I’d need them for, but I knew they packed easily and I’ve already used them a bunch of times. I have used one for treks into town to go sightseeing for the day, carrying sun lotions, the kids’ change purses for their gift shop shopping, and a bottle of water, for example. I also have used them to go back and forth to the public showers at the campgrounds, carrying razors, shampoo, conditioner and soap; wet things that I didn’t want to mix in with my changes of clothes in the bigger beach bag type of bag I was carrying towels and clothes in. The bags are perfect size for the kids to carry as well. Everyone has to have their own system and know what works well for them when packing for a trip like this, but the most important thing is just to have a system, whatever it is. Know how you’re storing things, where you’re storing things, and make sure everything has a place before you pull out of Dodge on that first day. You’ll want your space to be neat and organized, and easily re-done each time you’re ready to move to a new place. What a great post! Unfortunately my boys would NEVER be that organized or good about putting things back where they belong!!! Hope you are ha I g a great time! Thanks for all the great Facebook posts.. I am enjoying going on your trip with you, via pictures and blogs!